The GS200 is a low voltage/current DC source with high accuracy, high stability, and high resolution. With its excellent traceability, stability, and 5 1/2-digit resolution, the GS200 generates extremely low-noise DC voltage and current signals that are required for many applications. 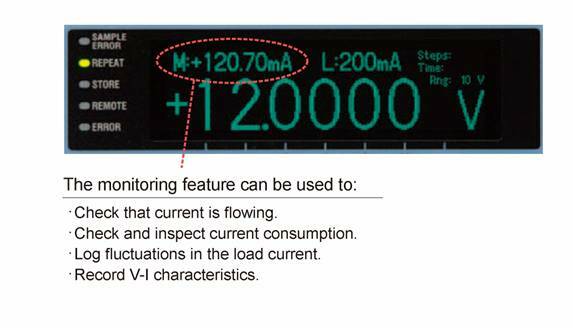 Additionally, the optional monitoring feature turns the GS200 into a voltage and current measuring instrument. Each DC voltage/current source in the GS200 series uses two DACs to generate highly accurate voltage and current at a high resolution. It is highly stable whether it is used for a short or long period of time and features superb linearity over all the ranges. Moreover, it produces extremely low noise. The GS200 features 5 1/2-digit, ±120,000-count output resolution for both voltage and current sources. At the 100 mV and 10 mV source ranges, the GS200 uses its highly accurate voltage divider to achieve extremely low noise levels, in the order of μV. The minimum output resolution of 100 nV and low noise output enable you to make extremely small changes to the signal level. The GS200 can perform four-quadrant operation by operating as a current source or a current sink in the range of ±30 V and ±200 mA. 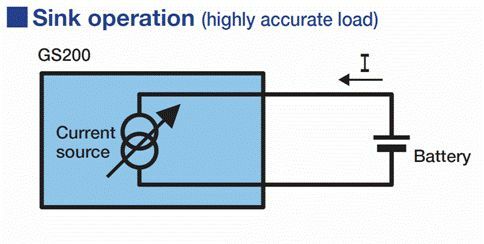 When the GS200 is sinking current, it can operate over the exact same range as when it is operating as a current source. You can use the GS200 not just as a highly accurate voltage source but also as a highly accurate constant-current electronic load. The GS200 bipolar output function inverts the signal polarity without the use of a mechanical contact. Thus, no abnormal voltage (or current) is generated when the polarity is inverted. This achieves truly continuous voltage variation from the maximum negative output to the maximum positive output. This feature is invaluable in the evaluation of zero-crossing comparators and in the output polarity inversion during program operation. Voltage or current glitches do not occur when the setting is changed within the same range. In addition to the GS200’s high accuracy voltage and current source features, it can also be equipped with an optional simple voltage and current monitoring feature. With this option, the GS200 can function as a current monitor when it is generating voltage and as a voltage monitor when it is generating current. The display resolution is 4 1/2 digits. The measured values can be stored along with the source values in the internal memory (USB mass storage device). An up/down key has been provided below each of the 5 1/2 digits for setting the source so that any digit can be readily changed. Changing the source value is easy, and increment/decrement resolution can also be set freely. This feature is invaluable during threshold level detection of the DUT and during measurements of V-I characteristics. In addition, the GS200’s high-resolution dot matrix VFD enables a large amount of information to be displayed. The GS200 also offers freely adjustable font sizes for improved readability and productivity. The GS200 has soft key menus for easy operation. 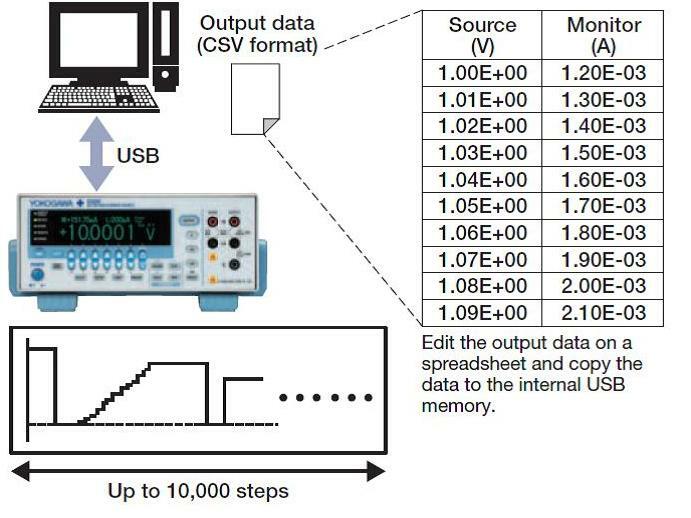 You can define up to 10,000 steps of output values and stored these steps to USB memory. You can also set the output interval, settling time, and other settings. If you connect the GS200 to a PC, the PC will detect the GS200 internal memory as an external storage medium (USB mass storage device). You can easily drag data from the PC to the GS200 internal memory. In addition, you can enter and edit output data using the GS200 keys. On models with the monitoring option, the measured data is stored to the internal memory along with the output data. You can easily drag the measured data from the GS200 to the PC. You can use the GS200 as a simple V-I curve tracer or data logger. By using multiple GS200s in synchronous operation, you can expand the number of channels that are available. 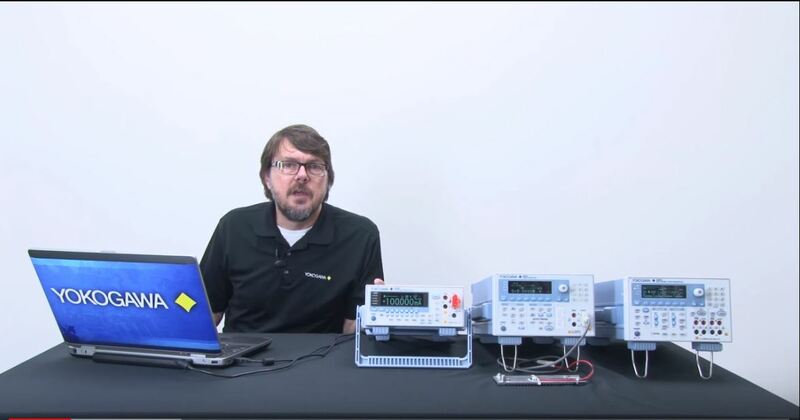 It is easy to apply voltages and monitor currents simultaneously on multiple pins. There is no need for synchronous control circuits or complicated wiring. 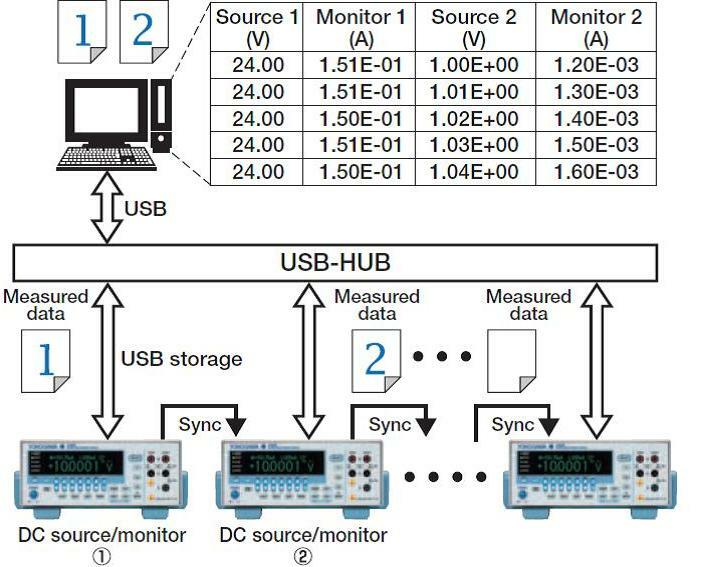 The source and monitored values are saved in CSV format to the internal memory (USB mass storage device) of each GS200. By collecting and merging these files, you can view a list of the relationships between the voltages and currents of multiple channels. Banana-plug (male)-BNC adapter. Use for circuits having voltage levels no greater than 42 V.
Set contains one black and one red clip. 1000 Vrms-CAT II. To realize working Josephson junction-based qubits requires a current source with low noise and high accuracy, stability and resolution. 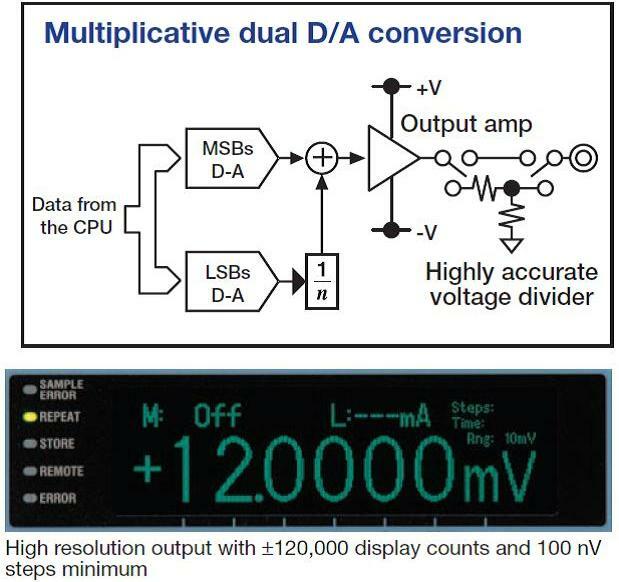 Click below to learn how the Yokogawa GS200 Precision DC Voltage / Current Source fulfils these requirements for the experimental quantum computing setups of Princeton University’s Dr Andras Gyenis.